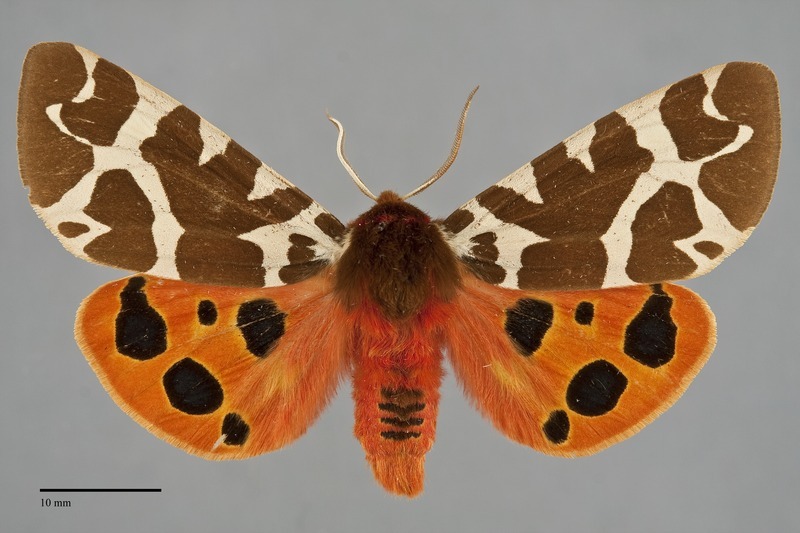 Arctia caja is a large (FW length 27 - 32 mm) brightly colored and boldly patterned tiger moth. The forewings are white with extensive dark gray brown lines and patches, appearing dark with criss-crossing white lines and spots. The hindwing is orange red with large round to slightly irregular black discal, basal, and submarginal spots containing metallic blue scales. The head and thorax match the dark forewing color with cream at the base of the collar and tegulae and red at the tip of the collar. 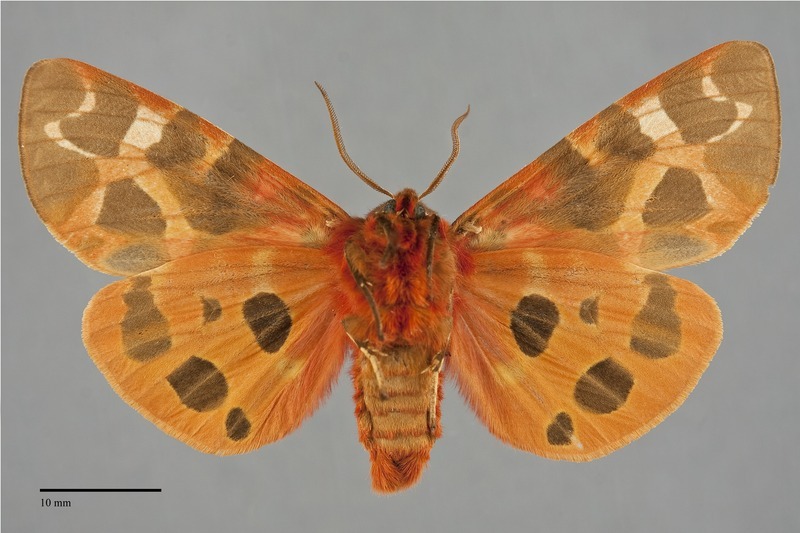 The abdomen is slightly darker red than the hindwings with black bars on four or five of the segments. The bipectinate antennae are white dorsally. The eyes are normal size for a nocturnal moth, appearing hemispherical. 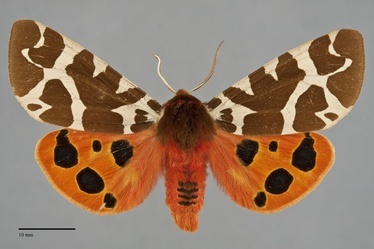 This species is much larger than other tiger moths with similar scheme of dark and light forewings and red and black hindwings. However, it closely resembles the northerly Arctia opulenta but is larger and has larger eyes. Those of A. opulenta are reduced typical of day-flying species. The ranges of these species do not overlap. Larva is densely covered with long hairs, orange at the head and along the lateral line, and black along the dorsum of the body. It is illustrated by Miller & Hammond (2003). This species is widely distributed across Canada, extending southward west of the Cascades and through the Rocky Mountain region at low elevations. In western Oregon, it is common in coastal grasslands near the ocean, coastal rainforests, mixed hardwood forests, and wet Willamette Valley prairie. East of the Cascades, it occurs in low elevation wet meadows along creeks and rivers, in disturbed agricultural areas, and even urban areas. Arctia caja is widespread west of the Cascade Mountains south of the lower Fraser Valley, British Columbia. East of the Cascades it is found in southern British Columbia, and throughout forests of eastern Washington and Idaho. Its range is more limited in eastern Oregon where it appear to only be found in the northeastern Blue Mountains. Arctia caja is found in Eurasia as well as in North America. The New World populations are widely distributed. Western records from outside the Pacific Northwest are from northeastern California and the Sierra Nevada, but most records are from the central Rocky Mountain states. In the east it is a species of boreal forest, occurring from Labrador south to New York. This species is a generalist feeding on many kinds of herbaceous plants such as vetches (Vicia spp.) in the Fabaceae and tansy ragwort (Senecio jacobaea) in the Asteraceae, but will also feed on low hardwood shrubs such as willows (Salix spp.) in the Salicaceae. Arctia caja is on the wing in mid to late summer. Most records are from mid July to the end of August. It is nocturnal and comes to lights.